NUS physicists have discovered that gold nanoparticles can enhance light emissions from tungsten disulphide (WS2) flakes and reveal minute changes in the material composition. Two-dimensional (2-D) transition metal dichalcogenides (TMDs) show great potential as sensors and optoelectronic devices as they are able to exhibit strong optical (fluorescent) signals. Tungsten disulfide (WS2), a type of TMD, has strong optical properties that are sensitive to its structural and chemical composition. Methods to functionalise its fluorescent properties are of interest because if the sensing action results in a colour change in the material, it becomes easier for the user to detect it. This fluorescence is due to the recombination of electron-hole pairs in the 2-D TMDs, which also have an associated electrical response that can be used for possible optoelectronic applications. 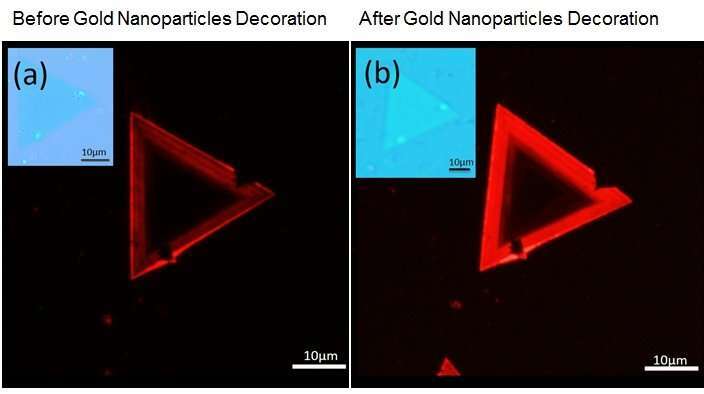 A research team led by Prof SOW Chorng Haur, from the Department of Physics, NUS has discovered that the addition of gold nanoparticles (Au NPs) to WS2 strengthens the fluorescence emissions from it, with the higher light intensity dominated by excitons. The Au NPs also behave like nano-explorers, exhibiting preferential, site-selective decoration that maps out interesting fluorescent patterns within the WS2 monolayers! These patterns are totally unexpected as the researchers had initially thought that the Au NPs would spread themselves in a random manner across the material. Prof Sow said, "Pristine WS2 monolayers exhibit a multitude of emissions from various excitons. When Au NPs are added, the electric field from light can couple with the surface electrons on the nanoparticles. The WS2 molecule benefits from this enhanced interaction to produce a brighter fluorescence." Prof Sow added, "Most remarkably, the Au NPs transform the fluorescent signal from WS2 which has multiple peaks and components into one that has a well-defined peak. The additional peaks may be attributed to negative trions, which are excitons that are strongly associated with an electron. With their strong affinity for electrons, the Au NPs decorated onto the n-type WS2 monoflake could effectively deplete the electron density in the WS2 monoflake and suppress trion formation. This can be useful for applications which require light with a narrow wavelength profile."